Dr. Schied has success fitting many hard to fit contacts, including high or irregular astigmatism, keratoconus, post-surgical, and presbyopic eyes. Our office is stocked with thousands of lenses enabling us to customize your contact lenses to your vision needs and wearing preferences. The many different materials and contact lens designs available often allow us to find solutions for patients who have been unable to wear contacts due to sensitivity, poor vision, dry eyes, discomfort, or allergies. We utilize computerized corneal topography to aid in fitting of contact lenses. The topographer maps the curvature of the front surface of your eyes and enables us to design and choose contact lenses to most appropriately fit your cornea surface. Mapping the cornea also helps the doctor determine if the lenses you have been wearing are adversely affecting the surface of your eyes. 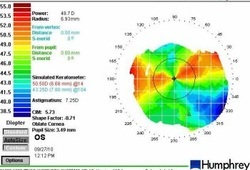 Computerized corneal topography is included in all of our contact lens evaluation services. as some of the specialty designs for unusual circumstances. Soft and silicone hydrogel lenses are the most popular options and are available for daily, 2 week, monthly, quarterly, or annual replacement. These are the very flexible, soft lenses with high moisture content. The new generation silicone hydrogel lenses are made of more breathable materials allowing more oxygen transparency than previous lenses, allowing greater comfort and longer wearing intervals for some patients. Soft contacts are the easiest to wear and the most comfortable contact lenses. Rigid gas permeable (RGP or GP) are made from rigid but breathable materials and provide for better vision for some people with corneal surface irregularities including keratoconus or irregular astigmatism. These lenses take longer to adapt to due to initial discomfort, but provide a good longer term solution for those whose vision benefits from the rigid designs. Bifocal or multifocal contact lenses come in soft or rigid materials. These lenses are designed to aid vision in near and distance when eyes have lost their ability to accommodate due to presbyopia. Several designs are made from different manufacturers that enable our doctors to work with you to find the most appropriate solution for you. Monovision is actually a fitting alternative to multifocal contacts. Some patients will find that this alternative of correcting one eye for distance and the other eye for near vision is the best solution for their needs. Aspheric contacts are able to sharpen the vision of some patients due to the optics design of the lenses. These are available in soft and rigid designs. Toric lenses correct for astigmatism by using a directional lens that positions itself on the eye to correct for the amount of astigmatism in each eye. These lenses can be made of soft or rigid materials and have thicker areas in the lens to orient the lens on your eye to correct for your cornea or lens irregularity. Colored contact lenses are normally worn for cosmetic reasons when patients want to change or enhance their eye color. For some situations where pupil irregularity exits or other medical reasons, colored lenses may be used to block out or reduce the amount of light entering the eyes. Note: all contact lenses require proper fitting and a prescription to be worn, even if you have no need for corrective lenses. Hybrid contact lenses including the ClearKone from Synergeyes lens are a rigid lens set in a soft lens skirt for comfort with the vision of a gas permeable lens. These lenses are used to correct for keratoconus and irregular astigmatism. Aphakic contact lenses are worn to replace the natural lens of your eye. These lenses are rarely used today since most of the time a replacement lens is implanted in place of the original lens. These are usually used if the eye has been damaged, or when other circumstances prevented an intraocular lens to be implanted. Piggy-Back lenses are actually a fitting technique where a soft contact lens is used in addition to a rigid lens. This combination is used in specialty situations with corneal irregularities like keratoconus. Scleral contact lenses are larger rigid lenses that cover the entire cornea of the eye, and rest on the sclera (outer white area.) These lenses are another alternative when corneal irregularities occur. Post-Surgical contacts for patients with a history of corneal procedures like Radial Keratotomy (RK), Photorefractive Keratectomy (PRK), Laser-Assisted-In-Situ Keratomileusis (LASIK), or corneal transplant and have need for vision correction. These are lenses custom made for corneas that have been altered by surgical procedures, and are outside the normal available parameters for contact lenses. There are more types of contact lenses available now than ever before. Some of the more popular lenses we use now are from Ciba, Bauch & Lomb, Coopervision, and Vistacon. Some lens brands commonly used for planned replacement are Acuvue, including the Advance Plus, 1-Day, Moist, Trueye, and Oasys lines; Air Optix and Nite & Day Aqua, Focus, Dailies, Dailies Total 1 and Freshlook from Ciba; Avaira, Biofinity, Biomedics, Cooperflex, Frequency 55, Proclear, Preference and Vertex from Coopervision; and Soflens and Purevision from B&L. Many of these lenses come in multifocal, bifocal and toric parameters for astigmatism.